It said that offenders included the Caracol Industrial Park in northern Haiti, which the United States helped build and has cited as a centerpiece of reconstruction efforts, and factories that make products for prominent retailers like Gap, Target and Walmart. Caracol Industrial Park. Photo copyright Kendra Helmer/USAID. The group’s report follows one in April by Better Work, an independent labor compliance group backed by the International Labor Organization and an arm of the World Bank, that found widespread wage violations in all 24 factories. 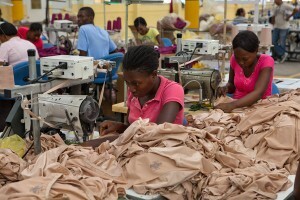 The Better Work report said just 16 percent of apparel workers who are paid by the number of pieces they produce earned 300 Haitian gourdes for an eight-hour day, or about $6.90, a minimum benchmark the factories must offer such workers. The Worker Rights Consortium said that in all five factories it investigated, workers needed more than the normal 48-hour week to produce enough to be paid that much, and they were also not adequately compensated for the extra time they worked to meet the quotas. Many workers were paid 200 gourdes, or about $4.60, the minimum wage for nonpiece work. The time-and-a-half premium for overtime, if paid at all, was often based on 200 gourdes rather than 300. Better Work is also expected to release its latest report on Wednesday. Richard Lavallée, the group’s program manager, said Tuesday that there has been an increase in workers earning 300 Haitian gourdes, but he declined to release details or to comment on the findings of the Worker Rights Consortium. He said Better Work and a Haitian government panel had begun work to clarify the wage law and its obligations. The consortium’s report is bound to add to the debate in Haiti and abroad over the garment factories, which the government and industry supporters contend provide desperately needed steady jobs in a country with few of them and will, they say, eventually lift the economy. Labor rights groups argue the factories exploit workers and pay unfair wages that are too meager for Haitians to support themselves, but that allow major retailers to keep costs of their products low. Henri-Claude Müller-Poitevien, the Haiti prime minister’s adviser on investment, said Haiti was working on training workers to improve their productivity. The industry is still trying to rebound after embargoes in its politically unstable years of the 1980s and ‘90s, and the January 2010 quake, took a toll. 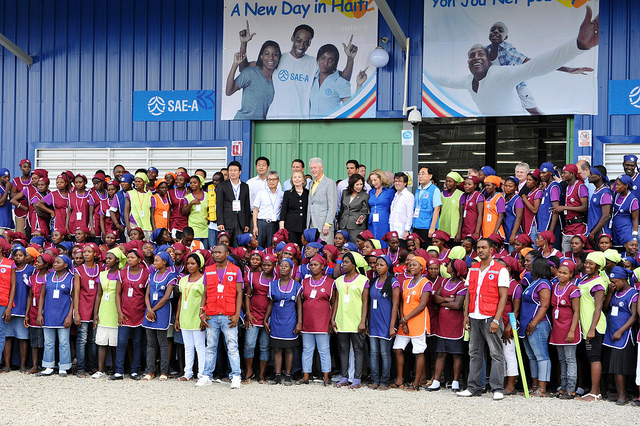 Lon Garwood, a spokesman for Sae-A, a South Korean manufacturer often criticized for its labor practices in developing countries and the main factory tenant at the Caracol park, disputed the group’s findings, saying all workers earned at least 200 Haitian gourdes for the day, though he did not say how many met the higher rate. Retailers named in the report, including Target, Walmart and Gap, whose products are made at the factories, would not comment directly on its findings, but said they cooperate with the Better Work program in an effort to improve wages and working conditions. The Worker Rights Consortium is a 12-year-old independent labor rights group financed by 180 American colleges and universities, including Harvard, Stanford and the University of Michigan. It monitors factories in dozens of countries, including Bangladesh, Honduras and Vietnam, that produce licensed goods with university logos. Some piece workers said they have struggled to earn 300 Haitian gourdes, that the minimum nonpiece pay of 200 gourdes makes it hard to make ends meet. “I am forced to live with debt,” said Rositha Guerrier, 27, who has worked at Sae-A for more than a year and said she was told she would be paid 350 Haitian gourdes a day, but makes 200. But like many workers she prefers to stay on the job because she has found few alternatives. Yannick Etienne, a labor organizer in Haiti, said a government bent more on developing the industry than protecting workers has not addressed the problem. “When a government is trying to attract investors on the basis of cheap labor to create jobs, this kind of violation is deemed to happen and accepted as the norm,” she said. Randal C. Archibold reported from Mexico City, and Steven Greenhouse from New York. André Paultre contributed from Port-au-Prince, Haiti.